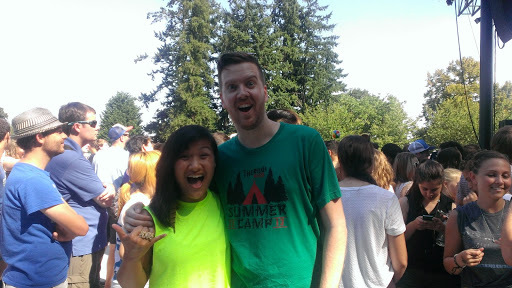 Found Gregr at Summer Camp! Coolest guy on the radio! First of all, I just wanted to apologize for the delayed post. I am a survivor of PCD, otherwise known as Post Concert Depression, and I am living with the side effects of partaking in an epic 11 band extravaganza (aka waking up at 1pm…haha)! If you have never been to summer camp as a kid, not to worry, 107.7 The End hosts one every summer and it’s probably 100 times more rock n’ roll and good vibes. Tickets are less than 30 bucks and you get to experience handfuls of rad bands, 11 to be exact! Here’s the run down of all the fun times you missed (or want to relive with me)! Royal Teeth – Opened up Summer Camp this year with bang. Their indie-melodic tunes were perfect for the nice summer air and got everyone warmed up for the rest of the day at Summer Camp! San Cisco – These guys are one of those bands that you like on the record, and even more live. Their presence on stage was just so contagious and they are probably the most adorable Australian indie pop bands, ever. Also, huge shout out to Scarlett on drums and vocals, you make it look WAY too easy! Said the Whale – I was super stoked to catch these guys and gal from our friendly neighbors, Vancouver BC, and they didn’t disappoint! Their hits, “I Love You” and “Camilo,” got everyone on their feet and rock horns up without a doubt! MS MR – Fierce, Fabulous, Synths, & Girl Power. That pretty much sums up MS MR. Lizzy commands the stage with her confidence and flawless vocals (& her lime green w/pink under layers hair was perfection), while Max is rocking the short-shorts and synths. This duo is unstoppable. Hey Marseilles – Seattle locals take the stage and treat the Summer Camp audience to that “classic Seattle sound” reminiscent of Death Cab and the like. Always a blast to hear them play and represent our city! Family of the Year – These guys and gal (I sense a pattern here, haha) ROCKED the stage with their upbeat tunes and serenaded the crowd with their beautiful “Hero.” The band’s set was as tight as their vocal harmonies and Christina’s lemon-lime Blondie-inspired bob was to die for. The Neighbourhood – Urban-indie-rockers (as I like to categorize them), The Neighbourhood, brought cool alt-hiphop-esque vibes to the Summer Camp crowd. Their extremely catchy “Sweater Weather” got everyone’s head bobbin’ and rockin’. Wavves – The dudes of Wavves brought me back to my high school days of REAL punk rock shows. If you could sit through their set of upbeat songs, there is probably something wrong. They will get you on your feet and moshing in no time. Surfer Blood – Surfer Blood definitely lived up to their name! I’m not sure if any of them surf, but their tunes are perfect for a day on the beach (or Summer Camp)! Cold War Kids – The “Hang Me Up to Drive” band delivered and ended Summer Camp perfectly! The bands bluesy-alt-rock energy is contagious and Matt’s vocals are ON POINT. Hope you had as much fun as I did, and if you weren’t there, hope to see you there next year!